In many ways Kidston has had an unusual history, according to James Cook University historian Jan Wegner. “Kidston was established surprisingly late,” Dr Wegner said. “The three gold-bearing hills later known as Wise’s, Mack’s and North’s Knobs, a few kilometres from the Copperfield River, are part of the Etheridge goldfield which began in 1868. 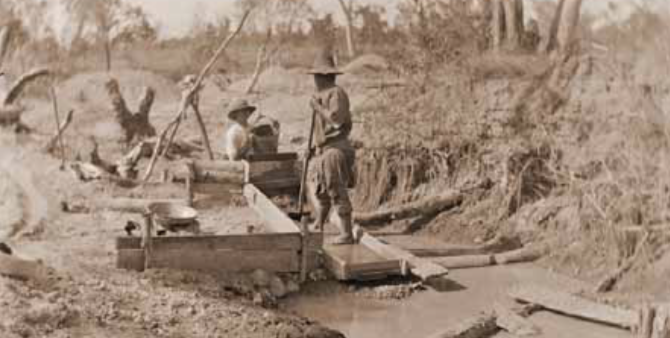 The discovery of gold at Kidston in 1907 was the start of a rich and varied history for the north Queensland mine. Not surprisingly, Mack’s haul of gold set tongues wagging. “A rush set in to the ‘Oaks’, named for the nearby Oaks outstation of Carpentaria Downs station,” Dr Wegner said. “This was alluvial gold, and excitement was intense about the ‘best little rush since the Palmer’. “Miners flooded in from all parts of the north and by May 1908 there were 1400 people on the Oaks rush and an estimated 430,000g of gold had been won. to support many, and the gold-bearing dirt needed to be carted to the river for washing. According to Dr Wegner, within a few months the field was dependent on dry blowers, used to extract gold particles from the soil without using water, the first time these machines had been used extensively in Queensland. “One witness said they were ‘almost as thick as flies in a sugar basin’,” Dr Wegner said. Even stranger, she said, was the fact that the majority of the miners were pro- temperance. “There were no ‘grog shops’ until April 1908 and the residents actively campaigned against allowing pubs on the field, delaying their appearance until October,” Dr Wegner said. “There was a progress association by February 1908, also unusual for a gold rush. “It helped the town get a school by July as miners brought their wives and children to the field. As the town settled down after its rush days, it became more respectable, with stores, halls, a telephone service, an ambulance and a dam to improve the water supply. Dr Wegner said while the alluvial gold didn’t last long and the population declined, some miners were already working small veins, or leaders, and crushing their stone by hand in ‘dolly pots’. “Rich results caused a second, smaller rush to peg claims on more leaders,” she said. “The field badly needed a crushing battery but the only possible place for a mill was the river bank, which the shire council had declared a sanitary reserve to protect the town’s water supply from miners’ camps. “Sense eventually prevailed and by the end of 1909 there were two small stamp batteries working. Dr Wegner said Kidston’s geology was unusual for the Etheridge area. “Instead of large quartz reefs, Kidston had a breccia pipe containing small veins of mineralised quartz, so that it paid to take out all the rock hosting the veins,” she said. “The ore was low-grade and needed cheap treatment, and the government helped out by supplying a state battery in 1922. Kidston’s fourth mining stage began in 1979 when Kidston Gold Mines took up the area, with production beginning in 1985 on a scale that dwarfed the earlier open cuts. “It was one of the earliest mines in Australia to use the fly in-fly out system,” Dr Wegner said. “The mine closed in 2001 and is now the first former gold mine in the world to become a source of non-polluting energy, using the pits and dam for a pumped storage hydro project. Historic images presented with this story are from the Reverend Frederic Charles Hall Photographic Collection, accessible from the James Cook University NQHeritage@JCU website. JCU Library gratefully acknowledges the support of Kenwyn Arthur Hall (grandson of the photographer).